So, you probably follow me on Instagram. That’s presumably how you came here. 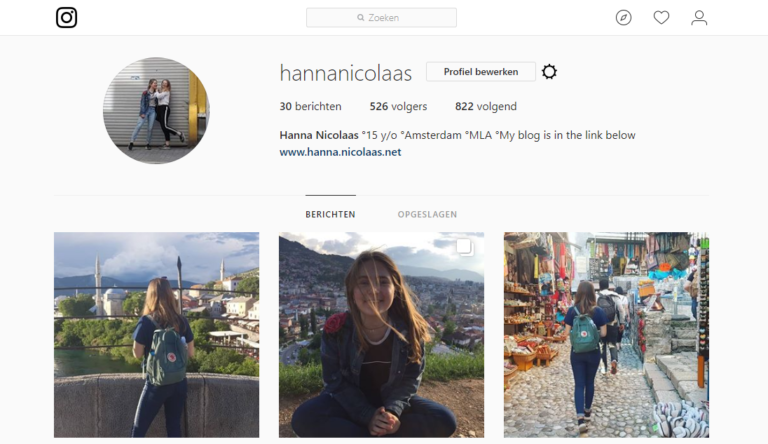 (@hannanicolaas) If not, please follow me. We searched for a little beach on Sardinia. Although we were at the coast, it was hard to find. After a 10-minute-walk, we came to this little beach. It was hidden behind ‘mountains’. To get to this beach, you had to walk over the ‘mountains’. The beach was downhill. So we swam here for like 2 hours. When the sun was setting and we were packing to go home, I asked my brother to take pictures of me. I ran back to the sea. This beach had no sand, but only shells. It hurt so bad, but I kept running, because there was not much time left. My brother was not in the mood for taking pictures, but I forced him. (Love you) After a few pictures we went back. I walked all the way back with bleeding feet. Nice. All for the instagram feed, right? So that story was actually true. Now some stories I wish were true. My friend Maamke took this picture of me in Antwerp, Belgium. We were walking through Antwerp. After like 5 minutes, we got lost. We are very awkward, so we didn’t want to talk to a stranger. Also, we thought we could do it ourselves. We definitely couldn’t. After a while, we were in this little alley. It had a cute stone wall. We didn’t know were to go and because we were already too late, a few pictures wouldn’t make a difference. (They totally would, but okay) We had a lot of fun and eventually we found the rest of the group. So the real story is really boring. We had a lot of fun, that part is true, but the rest is made up. I asked Maamke to take pictures of me and I took pictures of her. That’s all. This picture was shot in Mostar, Bosnia. Maamke took it (again yaas Maamke just takes all my pictures). I wish this was some secret spot in Mostar, that nobody can find. Some secret place that’s perfect for a romantic date. That we accidentally found. Maamke would spontaneous take a picture of me, without me knowing. Like a real picture. Just me looking at the water and view, for real. That I would see the picture, when she sent me al the pictures. But no. The whole city is the bridge. The bridge is beautiful, I have to admit. So Maamke and I did a photoshoot again. That’s it. The secret behind all my pictures is just: Maamke and I did a Photoshoot.